The circular economy is an opportunity worth trillions. Are retailers ready to take advantage of it? The circular economy offers a new way of looking at the relationships between markets, customers and our use of resources. Circular initiatives work to three principles of designing out waste and pollution, keeping products and materials in use and regenerating natural systems. It’s an approach that’s good for business, good for society and good for the environment. 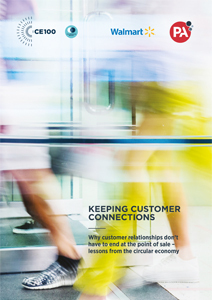 For retailers specifically, there are opportunities to engage customers in the circular economy at every stage of the product journey. This report was created with the Ellen MacArthur Foundation and several members of the CE100 group to help retailers start exploring and applying circular economy thinking. Customers’ views on resale, donating, recycling – what compels them to do it and how retailers can align with their preferences. The questions every retailer should be asking to take advantage of the opportunities.